Blog November 13, 2017 0 Milan A. More advanced customers who visit our air purifier website know that HEPA filters are nowadays a standard. Every decent air purifier must have HEPA filter. Some of the companies even went further and produced they unique HEPA filters that are supposedly working better than a standard HEPA filter. 1 But what is Ionic Air Purifier? But what is Ionic Air Purifier? Ionic air purifiers were very popular 20 years ago. They were the only available air filtration devices that were doing a fantastic job. 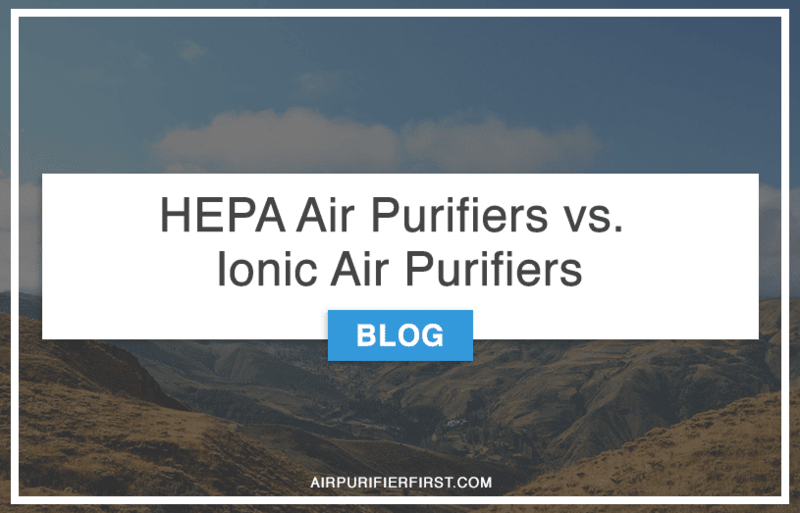 There are two types of ionic air purifiers. Electrostatic precipitators and ionizers. There is also a significant difference between this two. So let’s talk about them first. These devices do not use filters, and that is a positive thing. You will not need to bother with replacing a filter and will not need to invest more money into air filtration device. Electrostatic precipitators have plates that need to be cleaned. These plates are positive and negative. The best performance from electrostatic precipitators is when the plates are totally clean. And plates get dirty fast because all the dirt will be caught on them. You will need to clean the plates often if you wish to maintain high-quality air in the room. But even then if we compare this type of air purifier with the air purifier that uses HEPA filter we can see that the difference is significant. Air purifier with HEPA filter is just catching much more particles, and it has powers to capture even the smallest particles which electrostatic precipitators cannot get. But there is one negative side that concerns many users of electrostatic precipitators. While working, the plates and motors may produce ozone. And there are many studies done on the ozone generators, and the verdict is that even a small levels of ozone are harmful to the lungs and overall to all living beings. Not only to the humans but also the pets in the home may suffer. That why you need to make sure that the device you use is not generating ozone. Unfortunately, all of the electrostatic precipitators are generating ozone. All of them have motors and plates, and that just means ozone generation. Air ionizers are significantly different than electrostatic precipitators. Most of them, at least the high-quality ones are not using motors, so they don’t produce ozone. They work in a way to release negative ions. They generate negative ions. And negative ions job is to attach to other particles and make them heavier, so the smallest possible particles can no longer fly in the air freely. They then become heavy and stick to the floor, walls or furniture. The next thing you should do is to wipe everything in the room clean after the ion generator did its job. The only side effect with ion generators is that you should not be in a room when they work. All the harmful particles that get ionized may stick in your lungs and make your allergies problems even worse. In other words, these are not automatically used devices because you can not stay in the same room when they work. They have a good usage at removing bad odors and making an excellent air filtration as long as you don’t stay in the room. But even with this highly advanced technology behind the ion generation, they do not work better than a true HEPA filter air purifier. And some of the air purifiers include the ion generators inside their air purifier for even more excellent air filtration. But still, I would not recommend staying in the room when the option for ion generator is turned on. The best technology on the market for air filtration at this moment is the usage of true HEPA filters. True HEPA filter is capable of removing all kind of airborne particles that move through the air that is larger than 0.03 microns. And that is a lot of particles including pollen, dust, mold spores, pet dander and many other particles that may harm your health. Some brands even have HEPA filters that can remove bacteria and viruses. The only negative thing about this advanced technology is the maintenance cost and the higher than usual price for this kind of air purifier. HEPA filters may become too dirty too fast if the air quality in the room is disastrous. Another important fact is to use an air purifier in a room that fits its specifications. Many smaller HEPA air purifiers will not work well in bigger rooms and the filtration system will get dirty fast, and that will only put a more significant bill on the maintenance. I can not recommend using of harmful electrostatic precipitators because their time is over. Many studies show that they don’t work well and that they may produce hazardous ozone levels. Because of that facts, you should avoid them at all cost. Ione generators or so-called ionizers are a much better pick, but they also have their own flaws with successful air filtration. They don’t remove particles from the room, the particles stay on the floor or furniture, so the additional manual cleaning of the floor, furniture, and walls is required. And that just does not work with most of the customers. The problem is that every time you run the ion generator you will need to clean the room, and we know most of the people don’t wish to spend all days wiping the rooms. Air purifiers with HEPA filter are best to buy option in 2017. You will need to replace filters, and you will need to spend more money every 12 months on new filters. But the air quality and the power of filtering the pollution from the air will be done at the maximum capacity. The other advantage is that you can stay in the room while the air purifier works without needing to worry about any hazardous gases, ozone or anything else that may harm you.